At Paws-itivly our trainers have over 23 years combined experience teaching owners how to effectively train their dogs. Our trainers have studied and worked under a nationally recognized trainer and author. While they have experience training all breeds and personalities, their biggest pride comes from the experiences they have had working with aggressive or extremely shy dogs and their families and watching them blossom into wonderful family pets. 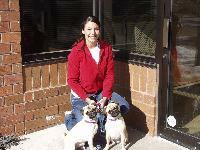 Tiffany Gutman is the owner of Paws-itivly Behaved K9s. She is the head of training at Paws-itivly Behaved K9s, has a Bachelors degree from UWM, a member of the Association for Pet Dog Trainers and an AKC registered CGC evaluator. She is an active member of Pets Helping People with her Rottweiler, Bodey, and is currently participating in the Reading to Rover program at the Brookfield Public Library. Bodey is a Canine Good Citizen and competes in AKC Obedience and Confirmation. She also works with numerous rescues helping them evaluate, rehabilitate and foster dogs. When she's not teaching or doing dog stuff, she enjoys spending time with her husband, son, daughter and her other furry family member, Mason, an American Pit Bull Terrier whom she adopted from the Wisconsin Humane Society and who is also a Canine Good Citizen. In July 2008, Bodey unfortunately passed away after a long and courageous battle with leukemia. He will always be remembered as an ambassador for his breed but more importantly a loving member of the Gutman family. Tiffany recently added to her pack with the addition of Ella and Patrick. Ella was only supposed to be a temporary guest for a behavior evaluation to assess if at 3 months she was too aggressive to be adopted out. Once Tiffany started working with her, she fell in love and now she is a permanent member of her family. After waiting years for her next special male rottie, Patrick finally arrived in December of 2008. After living many years with older dogs and forgetting how much work puppies are let alone two under the age of 1, she has a new appreciation for all puppy owners. 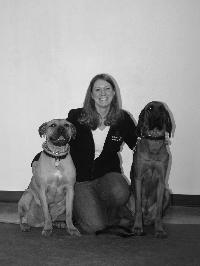 Deanna Trampe is an instructor at Paws-itivly Behaved K9s. She is a professional member of the International Association of Canine Professionals, a member of the American Rottweiler Club and an AKC Canine Good Citizen Evaluator. She started training dogs 15 years ago with her first dog, Bayla, a Beagle mix. Besides the sport of obedience, she and her dogs (past and present) have participated in confirmation (top 10 UKC Champion Rottweiler), therapy work (one of the first Rottweilers to join Pets Helping People), agility and flyball. She got her start in teaching as a training assistant in 1997 and has instructed classes since 2002. She currently shares her home with her beloved Beagle mix and her boys - Truman (certified Canine Good Citizen) and Benny (currently working on his CGC title) - two adopted Rottweilers; her constant inspiration and breed ambassadors. When she is not working with her dogs, she is spending time with her husband and daughter. 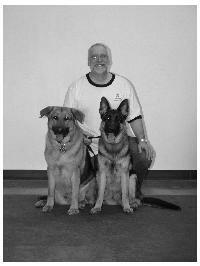 Steve Gannaway is an instructor with Paws-itivly Behaved K9s. He started training dogs nine years ago with his first dog, Sugar - a white Shepherd/Yellow Lab mix. He enjoyed training her so much that he wanted to pass along his enthusiasm to others by becoming an instructor and working with dogs and their owners. That was seven years ago. Since starting a career in dog training, he has added two additional members to the family - Emma and Peanut. All three of his dogs are CGC certified. Beyond obedience, he also has participated in the sports of flyball and retrieving with his dogs. When not working with dogs, he enjoys spending time with his daughter and wife and enjoying outdoor activities. Kelli Lindstrom is an assistant with the Paws-itivly Behaved K9s team. Being part of this organization gives her the opportunity to work with dogs, which is one of her passions. Kelli and her husband share their home with their two "kids," Bernie (German Shepherd) and Sasha (Husky/Shepherd mix). Kelli came to Paws-itivly to get a handle on some behavior issues that her dogs were exhibiting. She found through consistent training that a lot of "problem" behaviors can be turned around which has inspired her to continue their training. Through a lot of hard work, consistency and patience both Bernie and Sasha are certified Canine Good Citizens and certified Pet Therapy dogs. Besides being an animal enthusiast, Kelli has a Bachelor's degree from UW-Whitewater and works as a secretary in local elementary school. Lisa Mills is an assistant trainer with Paws-itivly Behaved K9s. Living with two American Staffordshire Terriers (Rocco and Zoe) and one American Pit Bull Terrier (Samson), Lisa knew the importance of obedience training. This was not just important from a personal standpoint, but also her mission in shedding a positive light on the breeds she loves. With her commitment and dedication to these "bad" breeds, Samson is a Canine Good Citizen and Rocco and Zoe are currently being groomed for the program. When Lisa is not at the training facility, she is running her own business, Fitness Together, which has many locations throughout Milwaukee and Northern Illinois, along with her husband. Mary Ann Richards is an instructor with Paws-ivitly Behaved K9s. She has been associated with the facility since 2004 when she began taking her first female Rottweiler puppy, Keela, through training. Keela is now a certified Canine Good Citizen who hopes to compete in obedience and agility trials soon. Mary Ann has a Bachelor's degree from Beloit College where she played college soccer and studied abroad in Africa. When Mary Ann is not concentrating on "dog stuff" she can be found working in the legal field on most days or enjoying time with her husband and her Rottweilers Keela and Charlie. 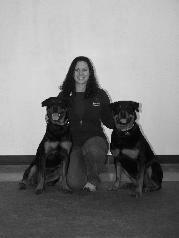 Jennifer Hassett is an assistant trainer with Paws-itivly Behaved K9s. She came to the facility to solve some problems in her multi-dog household. Through consistency and training, those issues were resolved. All three of her labs, Claudia, Moe and Torrey are now certified therapy dogs. Jen is passionate about dogs and this love inspires her to teach and share her love of animals with others. Jen actively competes in obedience, rally and agility. When not with her dogs, Jen is finishing her degree at Northwestern University and working as a manager in Chicago. John Sanheim is an assistant at Paws-itivly Behaved K9s. John began classes with his German Shepherd puppy Buddy more than three years ago. Since that time Buddy has achieved the AKC Canine Good Citizen title and his International Therapy Dog Certification. John and Buddy currently do therapy work in <?xml:namespace prefix = st1 ns = "urn:schemas-microsoft-com:office:smarttags" />Milwaukee and West Allis. John is a retired Marketing executive and accomplished military artist/illustrator. He resides in Milwaukee with wife Amy and German Shepherds Buddy (4 yrs) and Heidi (7 months). John is also very active with new grand child Josiah (5 months). 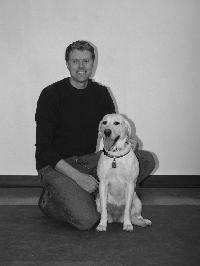 Jay Luikart is an assistant trainer with Paws-itivly Behaved K9s. He started training with his Yellow Lab Indy (named after Indiana Jones) when she was a puppy in 2006. He's quickly found that with a bit of effort and hard work dog training is very rewarding for both the owner and the dog, and is excited to share that with others. Indy has an AKC Canine Good Citizen title, and when she's not training she can very likely be found diving after a retrieving dummy in <?xml:namespace prefix = st1 ns = "urn:schemas-microsoft-com:office:smarttags" />Lake Michigan. Jay is a graduate of UW-Madison with a Food Science degree, and is fortunate enough to put the degree to use at a chocolate factory. Jay and enjoys spending time with his wife and participating in any outdoor activities he can find - usually with Indy not too far behind.